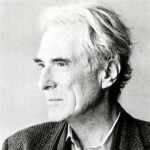 Mark Strand died this past week at the age of 80 though he, and the poetry he produced across many decades, seemed timeless. If you came of age in the 1970s as I did, he was one of the demigods in the poetry firmament. Tall, lean, silver-haired in later years and shockingly handsome, he couldn’t help but be a commanding presence at readings and parties, though he seemed oblivious to the attention he generated. His spare, deceptively simple lines had a way of snapping back at you, whip-like, reminding you that nothing is ever what it seems. Along with all the other important awards, he won a Pulitzer Prize for Blizzard of One in 1999, was the nation’s Poet Laureate, a Chancellor of the Academy of American Poets, and a noted translator, editor, and prose writer. He had originally hoped to be an artist, and toward the end of his life he started to create collages. The last time I heard him read, several years ago, he claimed that what he’d been writing recently wasn’t poetry. “I’m not sure what it is,” he said. When he began to read, a dog who had been sleeping nearby, climbed up on the couch beside him and sat, listening intently, his gaze never leaving the poet’s face. Strand had a wonderful speaking voice — slow, rhythmic, and precise. We were mesmerized by his words (whatever he chose to call it, they sounded like poetry), and by the fact that his powers to enchant so clearly reached beyond the realm of the humans in the room. The high ones die, die. They die. You look up and who’s there? –Easy, easy, Mr. Bones. I is on your side. and cried, and I have to live. A generation of very fine poets is slipping from our midst. Thanks, Patty. The Dream Songs — so wise and angry at the same time! Almost all the great ones we came up with are gone now. We’re so lucky to have what they left behind for us to remember them by.